Go beyond the gate with an expert guide on the Chinatown Experience Tour. Guests will be treated to tastings of BBQ pork, mooncakes, bubble tea; and learn the fables associated with various treats. Understand yin and yang and its expression in everything from food to architecture to medicine as we visit a traditional Chinese herbalist's shop. Explore the abundant fruits and vegetables in the grocery store, peek in on the live fish and get expert tips on ingredients and techniques to make stir-fries sing. The tour ends with dim sum at Hei La Moon, savoring dumplings and more as the steam carts roll by. Yes! I do group tours! I love hosting school tours! If you’re looking for a fun, cross-cultural experience to introduce your students to sights, tastes, fables of this rich, historic enclave contact me to arrange your school tour! I’ll work with your time constraints and arrange age-appropriate tours to engage your students and spark their curiosity. Who needs more stuff? Make gift-giving more fun this year by gifting an experience! 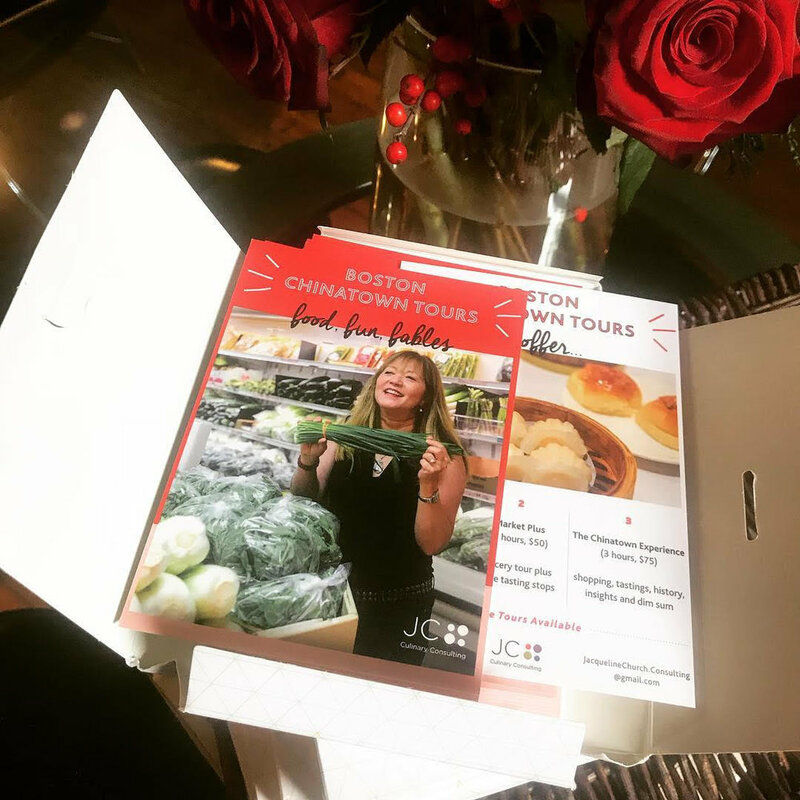 Boston Chinatown Tours make fabulous gifts! Birthdays, graduations, house-warming, Mother’s Day, Father’s Day, weddings - experience gifts are so hot now. Take a look at our reviews on Trip Advisor. A tour is fun, delicious and it creates a memory that will last. By far the most popular tour. Tasting, shopping, history, insights, concludes with dim sum (3 hours, $75). Chinese Market Secrets - Perfect for foodies who want an aisle by aisle grocery introduction including: expert tips, secret ingredients, ramen hacks (1 hour, $50). Market Plus - A shorter grocery tour plus three tasting stops (2 hours, $50). Tours begin and end at the Chinatown Gate, except for the Chinatown Experience Tour, which ends with dim sum at Hei La Moon. Need a tour on a date you don't see on the calendar? Just ask. I will try to accommodate your scheduling needs. Special diets: we've been able to accommodate a variety of special considerations, I'll make every effort to work with food allergies or intolerances. I always thought I’d leave for NYC or SF after law school, but Boston and my husband, a Hong Kong-born California-raised transplant, stole my heart. Having lived through some “Joy Luck Club” family dinners, I can attest to the rich delights of Chinese food & culture, as well as the pitfalls! With years of public speaking and corporate training experience, and leading cooking classes (both public and private), I bring expertise in teaching, and in sharing food and culture in an entertaining way. My passion for the Chinese culture and its food shines through in years of five star reviews. 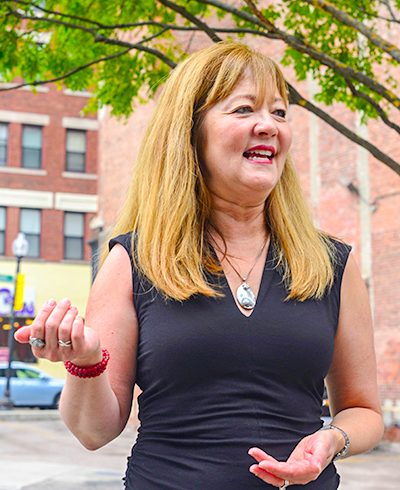 I share personal insights, local history, and insider tips, in a lively and engaging way. I've developed relationships with a wonderful group of vendors who share authentic tastes of Chinatown; guests leave happy, feeling as though they've traveled to another destination. Learn more about me on Boston Voyager's Influencer's page. JOIN ME IN BOSTON'S CHINATOWN - Book Now! 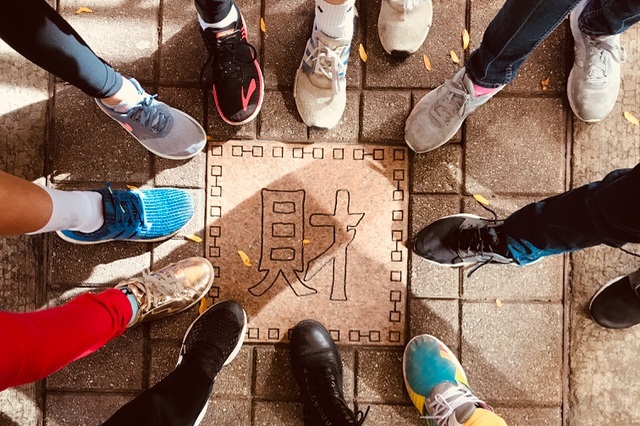 "The detail of backstory offered by Jackie provided valuable context for understanding the rest of the stops along the way... it’s a tremendous experience and Jackie is an amazing guide to the details and culinary joys of Chinatown." "Bring your appetite for knowledge and food! Jackie our tour guide was cheerful and full of wonderful history of Chinatown. She was energetic and had loads of fun stories." "Jackie was knowledgeable and light-hearted, with a passion for what she does and an obvious desire to share." The memories made during an interactive experience last forever. These tours make wonderful gifts for weddings, birthdays, anniversaries, graduations - all manner of celebrations! 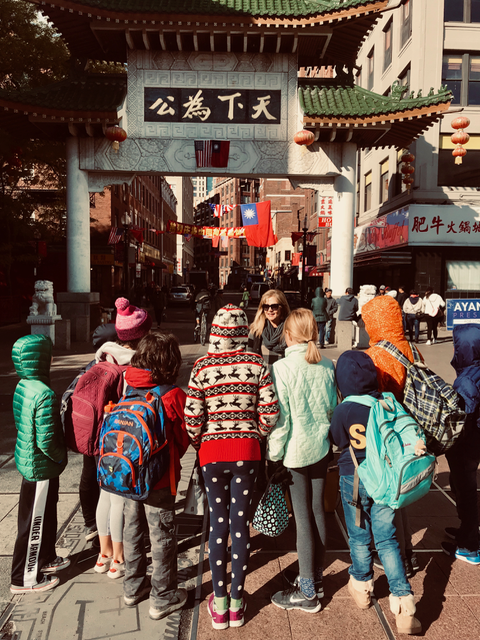 A Chinatown tour is a great introduction to Boston for out of town guests, college students, and new residents. 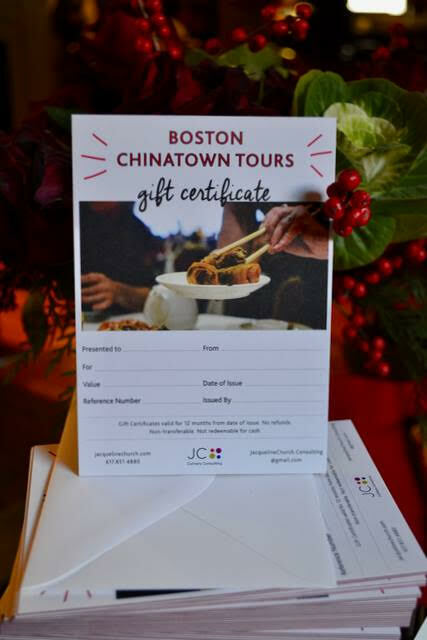 Giving a Boston Chinatown Tours gift certificate is always in great taste. Contact me for a beautiful gift card, printed on heavy stock, red-edged and in its own envelope or go electronic and order below. I want a GIFT Certificate!